ISP Technologies Theta : brings the full performance of the High Gain section of the THETA™ amplifier and THETA™ Rack-mount Preamp down to a foot pedal based Preamplifier pedal. 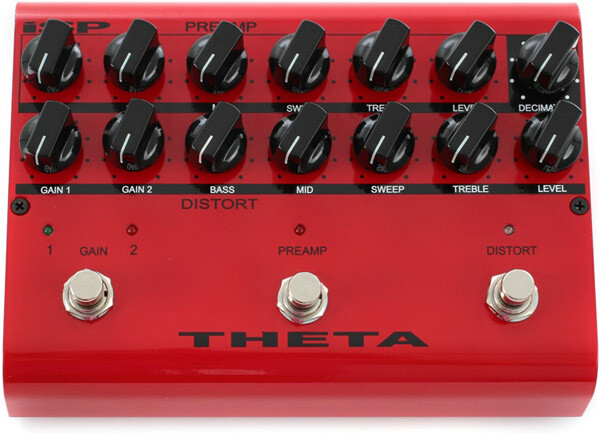 The THETA™ PREAMP PEDAL includes a full Pre-Distort Preamplifier, THETA™ High Gain Distortion Stage and to keep things quiet, a full implementation of the award winning Decimator G-string II™ circuit. The Preamplifier section includes controls for Gain, Bass, Midrange boost/cut Level and Midrange Sweep from 300 to 3KHz, Treble and Preamp Level. The Preamp section can be used stand-alone for clean tone shaping and/or used to overdrive the front of the THETA™ High Gain distortion stage. The Distortion controls include footswichable Gain 1 and Gain 2 for selection of a crunch and over the top gain, Bass Midrange boost/cut Level, Midrange Sweep from 300 to 3KHz, Treble and output level. The Decimator G-String II™ circuit has a Decimator Threshold control and provides the full Time Vector Processing™ circuit with the latest Decimator improvements of Linearized release response, which improves the smoothness of the release response of the Decimator. Another incredible feature we added is Dynamic Saturation Modulation, which emulates the spongy modulated dynamics of a full throttle tube amplifier with a vintage tube rectifier power section. While subtle, this adds yet another dimension to the THETA™ performance. The trademark sound of the THETA™ amplifier series is over the top gain and sustain with over 160db of gain on tap and incredible tone shaping flexibility. The front end Preamplifier can be used to over-drive the input section of the THETA™ distortion circuit with mind blowing amounts of gain and pre-distort tone shaping. The only way we can provide this level of gain is due to the inclusion of the on-board Decimator G-String II™ circuit, which tracks the envelope of the input signal and provides greater than 80db of noise reduction. The THETA™ PREAMP PEDAL is a true professional guitar Preamplifier with an internal +/-15 volt power supply providing more than 3 times the headroom of a typical 9 volt pedal. This amount of headroom is required for proper tone shaping and a higher level of performance than would otherwise be possible with a standard 9 volt power supply. Add to all of these features dual remote control jacks, which allow all of the THETA™ PREAMP PEDAL switch functions to be controlled via MIDI control functions or simple switch closure, and you have one powerhouse Guitar Preamplifier. The THETA™ distortion circuit is in a class of its own with better sensitivity, response and tone than any other guitar preamplifier. The discerning player knows how much better you can play when the response between their fingers and their ears becomes magic. That is the definable level of performance that the THETA™ provides.